Taste test: These are thicker and crunchier than the regular Walkers chips, and they come in a fancier bag. 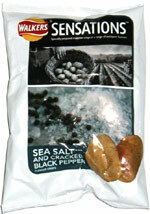 They've got a nice, mild pepper taste, less peppery than some other salt and pepper chips that I've tried. Unless you get a piece of pepper stuck in your throat (as I did), they're not really peppery enough to make you sneeze. Can't really notice any sea salt (as opposed to regular salt) in the flavor, and in fact the pepper is much more prominent than the salt. A good snack. Smell test: Very peppery, like freshly ground black pepper. Nice. 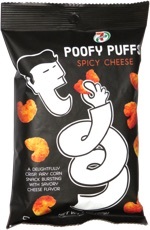 This snack was discovered by Tim in London. Review published .